Fresh protests have taken place in the Gulf sultanate of Oman, following a wave of pro-democracy demonstrations across the Arab world. 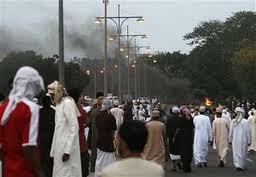 The unrest in Sohar has been a rare outbreak of discontent in the normally calm sultanate of Oman. Looks like half the world is protesting , guess they have a good reason ! They're falling down like nine-pins - if only these changes could turn out to be for the betterment of all. Another domino falls and no doubt there will be more.